Many homeowners want as few downspouts as possible for various reasons. For some it is budget, for some it is aesthetics. 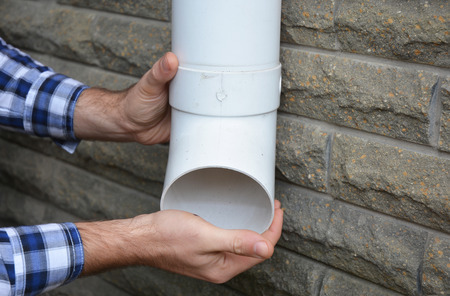 The most common residential downspout is 2”x 3” and will handle 600 sq. ft. of roof. That is not to say that all 600 sq.ft. roof sections are the same. A roof with a 20’ eave and 30’ to the ridge and a 6:12 pitch will drain water faster than a roof with a 40’ eave, 15’ to the ridge and a 3:12 pitch. So, an extra downspout may be a good idea. Also, does that mean that at 601 sq.ft. you need another downspout? No, it doesn’t. Potential debris-are there a lot of trees or is the surrounding area without foliage? Length of the gutter run? Is it one long run? Where is the water draining to? While I tend to suggest as few downspouts as possible, I will occasionally make a hard case for additional downspouts. As I have mentioned before, gutters-and downspouts- are the cheapest insurance you can have to safeguard your landscaping, your foundation and your siding. If you desire one long run of gutter, then it will most likely be mounted close to level. This is going to slow down the flow of water in the gutter. As water slows, debris and sediment will build up in the bottom of the gutter. Faster water flow will help to keep the gutter bottom clean. So, if slow water flow is anticipated, then additional downspouts should be considered. With hip roofs you can have a gutter system with quite a few corners. Every time water turns a corner it slows down. So, the number of corners can also impact the number of downspouts. Likewise, if there are a lot of trees and foliage that get deposited onto your roof and end up in the gutter, then you will likely not want to limit your downspouts unless cleaning your gutters often is something you look forward to. You should also consider the area where your water is going to drain. If your desire one downspout and you want it to drain into a “contained” flowerbed, then you should probably rethink the idea. I never like to drain water into a captive area. Either relocate the downspout or add another. Adding another will lessen the amount of water draining into the captive area.